This compact and esthetic unit is ideally suited for a variety of agent-releasing applications such as FM-200, CO2, Dry & Wet Chemical. Large unit accommodating more zones are also available. Agent can be releasing automatically or manually. 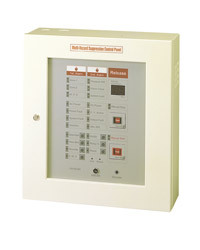 System enables highly reliable monitoring and suppression control. Audible and visible indication when system has fault condition.